Earlier this week, we served baked sweet potatoes in the cafe with some grilled pork chops, and at the end of service I had about a dozen baked sweet potatoes left. I didn’t have enough to make a casserole and we had just served sweet potato pie, so I turned those tasty baked sweet potatoes into sweet potato pancakes for breakfast. This morning we awoke to a hint of fall in the air. One of those mornings where you throw open the windows and air out the house. We don’t get mornings like this often in the deep south, not this early in the year. I found myself craving some of these pancakes but we had no maple syrup and maple syrup is what you need to compliment them. I don’t recommend using pancake syrup. In fact, many times I’ll eat them with no syrup at all. Just some melted butter and a sprinkle of brown sugar. If you are accustomed to only making pancakes from a box, give this recipe a try! In a large bowl, sift together the flour, baking powder, salt and nutmeg. To the dry ingredients, add the remaining ingredients and mix well. Spoon or drop scoopfuls of the batter on to a hot, greased grilled or teflon coating frying pan. Cook until edges begin to dry out and air bubbles are popping on top of the pancake, then flip and cook opposite side until golden brown. 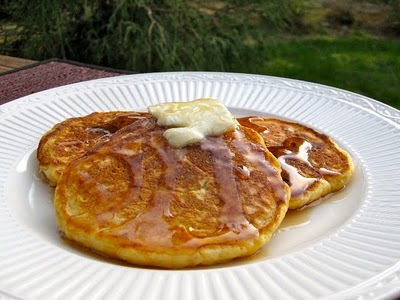 Serve with pure maple syrup or drizzle with butter and sprinkle with dark brown sugar. Hi – Thanks for recommending a pan with Teflon® nonstick coating for your Sweet Potato Pancake recipe. I represent DuPont and it’s always a pleasure to see people recommending our products.